California Lightworks offers the 220 Full Cycle LED grow light for vegetative development and for enhanced blooms. The light is high intensity, bright, and designed to support plant growth through all stages. Some lights offer support for either vegetative growth, or bloom enhancement. The SolarFlare was designed to cover it all. The 220 full cycle is comprised of 72 high flux bin LEDs engineered to emit the right recipe of light that plants need for full robust growth. 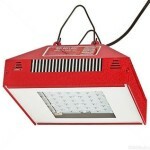 It is designed to replace a 400 watt HPS or Metal Halide system. This is great news for avid indoor growers looking for a high power LED grow light that can work more efficiently to save money and time. The 220 Solar Flare features a full cycle mode, a vegmaster mode, and a bloombooster mode. The various control modes add to the product efficiency and functionality. The SolarFlare 220 gives growers more control and more control allows growers to individualize the growing process to reach better outcomes. For this reason, the SolarFlare 220 is a popular product in the realm of LED grow light technology. California Lightworks has been in business since 2000. The company has over 15 years of experience developing LED technology. This development ultimately led to green house lighting technology and the aim of advancing product technology to enhance unit efficiency. The corporation, MWW Inc. d.b.a California Lightworks, is based in California and has a registered history with the Better Business Bureau. The R&D and manufacturing facilities for the company are located in Canoga Park, California. California Lightworks began focusing heavily on LED grow light technology in 2008 and holds various patents for associated LED grow light products. StealthLED and ExtremeLED are names of LED grow lights that California Lightworks developed and manufactured in the past. Solar Storm and Solar Flare are two primary LED grow lights that the company promotes at this time. 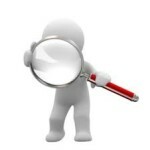 The company is U.S. based and does its best to utilize U.S. based vendors when possible. California Lightworks is primarily an in-house operation meaning that design and assembly of the lights is done in the California Lightworks facilities. Testing of the assembled LED grow light product happens at the California Lightworks facilities prior to shipping. The company is primarily focused on horticulture grow light technology and works closely with indoor growers and testers to make sure that their lights are top of the line. I can tell you first hand that California Lightworks is considered one of the top tier grow light companies in business. During discussions I have had with other grow light competitors, California Lightworks has been mentioned more than once as a top competitor. Other grow light companies want their products to be considered in the same category. Having the competition reference California Lightworks in this manner told me a lot about their product before I ever laid my hands on one. The SolarFlare 220 LED grow light is produced by a highly reputable and respected company. It has 44 top tier quality 5 watt LEDs that add up to 220 watts of power. In comparison, the SolarFlare 220 exceeds the PPF of a 400 watt HPS grow light system. The 5 watt diodes are new super high flux and were designed to improve the units in 2014. More LEDs were added to this unit utilizing high quality ceramic substrates to emit 10 to 15 percent more light while using the same power. Efficiency is the name of the game with the SolarFlare 220 unit from California Lightworks. The company offers a 3 year warranty on the SolarFlare 220. The design allows the light to be used in conjunction with up to 10 total lights that can be controlled on the same timer. 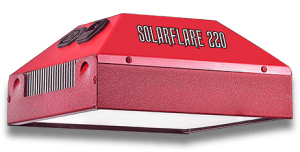 Shipping is free and at the price of $439.00, the SolarFlare 220 is competitively priced. 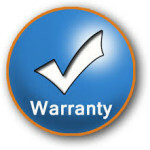 The California Lightworks product warranty bumped up to a three year plan several years back. This bests the standard two year plan that many other LED grow light companies offer. The fact that the company is willing to offer an additional year of warranty coverage over what many other companies are willing to offer highlights why the company is considered one of the top tier LED grow light producers. 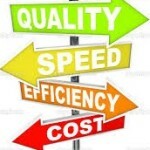 The company obviously has great confidence in their products’ quality and effectiveness. Light Spectrum that provides deep red, red, deep blue, blue and white light which works to feed your plants the proper light diet needed to support healthy development during the vegetative and flowering stages. There is no need to change this light out between stages of growth. Emits the dominant wavelengths of 450nm, 470nm, 620nm, 665nm, and warm white at 3100k to optimize PAR. Power efficiency. The 220 SolarFlare can be up to 50 percent more power efficient than a comparable HID. This means lower electric bills and additional cost savings for the grower. LED grow lights do not run high working temperatures. I have had mine on for over 12 hours and the light is just warm to the touch. The grower utilizing the SolarFlare 220 will spend less on cooling fans and ventilation systems. Less time and money focused on cooling the surrounding environment means more time and money that the grower can invest elsewhere. LED efficiencies lead to a longer lifespan for the LED grow light product. The SolarFlare 220 is rated for a lifespan of at least 50,000 hours which is far longer than other HPS or fluorescent lighting systems. Over time, this is another piece of the LED grow light puzzle that will save a grower a noticeable amount of cash. The SolarFlare LED grow lights are equipped with built in power supplies and do not require additional ballasts. Installation is quick and painless and should only take 15 minutes or so. I was able to hang my light in a relatively small amount of time. In general, LED grow lights are the most efficient grow lights available regarding their ability to deliver light. PAR light is just the right recipe of light that research shows optimizes plant photosynthesis. The SolarFlare 220 is engineered with LEDs that emit the exact wavelengths needed for plants to grow in a robust and healthy way. In the end, the SolarFlare offers the right light frequencies while reducing energy costs by 50 percent or more. As with other brand name LED grow lights considered to be top tier lights, the cost of the light can be somewhat prohibitive. I have experienced working with lower tier LED grow lights and I can testify that less headaches and problems arise when using a top tier model such as the 220 SolarFlare. Growers should keep in mind that if they are transitioning from the HID or fluorescent grow lights, they are going to see cost savings from running the LED and if this your first grow light, you will not need to install additional fans and cooling equipment. California Lightworks presents detailed information about plant growth outcomes when using their grow lights. They note that their grow results are attained by following Sea of Green (SOG) or Sea of Green (SCROG) techniques. These techniques can help to promote a flowering canopy depth to between 12″ – 16″ with all flower sites receiving optimal light exposure. These techniques can help any indoor grower find better results and more robust plant yields. General research shows that LED grow lights can be as productive, if not more productive, than HIDs or Fluorescents. It also shows that LEDs can lead to notable cost savings over time due to energy efficiency and energy cost savings. The 220 SolarFlare is a high powered LED grow light that integrates full spectrum wavelengths to support plant growth. It is considered a top tier light by the competition and is priced competitively. 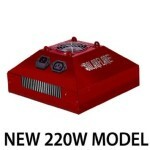 The SolarFlare 220 unit is state of the art LED grow light technology for indoor grow rooms and greenhouse gardens. The unit has an optimal balance between high quality LEDs and strong light production while keeping its price competitive relative to other LED grow lights that can produce the same type of light and plant yield. In my opinion, it is a great light, especially for an indoor grower. 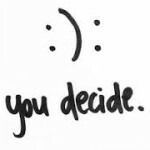 Now it is time for you to decide. Time to grow big at home!